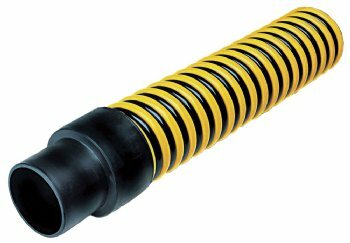 All extruded heavy wall sanitation suction hose. Unique interlock construction provides for extreme flexibility and kink resistance. Smooth interior for optimum flow and unique crush resistance. An external wear rib prevents damage from abrasion. Used for liquid transfer; sanitary and cesspool. Suction; construction and quarry. Suction service; machine and tank liquid transfer and more.